MB regulars will already know David Hanke from his classy ‘northern’ jazz breakbeat releases under his Renegades Of Jazz alter ego and be aware that he also trades as one half of funky breakbeaters Mash & Munkee, so it will probably not come as a surprise that he has yet another iron in the fire (i.e. Unifairfly) nor that it smoulders with quality. This time around he’s paired up with Hungarian producer Nandor Kurtossy (whose name has accents my laptop keyboard has never even seen before) and together they are travelling as Savages & Unifairfly. Give ‘em a listen and you’ll find yourself taken on a chilled funky breakbeat ride of the kind that Sadat X used to style over. 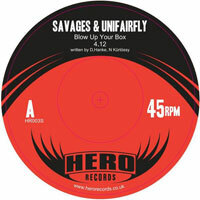 (PRESS RELEASE) Hero Records return after their last offering from Hero No.7 and Mash & Munkee, this time slowing the pace for a downtempo funky hip hop double-sider from Savages & Unifairfly. After getting in touch for a remix, Nándor and David discovered similar tastes for producing funk, soul and jazz influenced hip hop tunes and a shared love for the sound of labels like Puma Strut, 7 Hills and Breakin’ Bread which in turn lead to the duo collaborating on the pair of deep down and dirty funk tracks you’ll find on this release. The a-side ”Blow Up Your Box” features funky bass and drums breaks and catchy hip hop vocal samples and is dedicated to all B-Boys and B-Girls. The flipside track “Mean Streets” is a funk-filled cinematic, gangster hip hop tune inspired by the film of the same name. 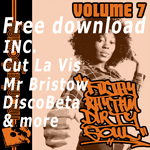 Two tracks of funk for your feet that will appeal to lovers of funk, hip hop and breaks who like to get down and dirty.